One evening, Brian and I had a light dinner in preparation for a late night snack. When darkness fell we turned on the spreader lights, got out the squid jig, and sat down to watch a movie and wait. Every few hours we’d go up on deck and scan the perimeter of the boat for squid. They are attracted to the spreader lights. Soon enough we spotted the first squid. 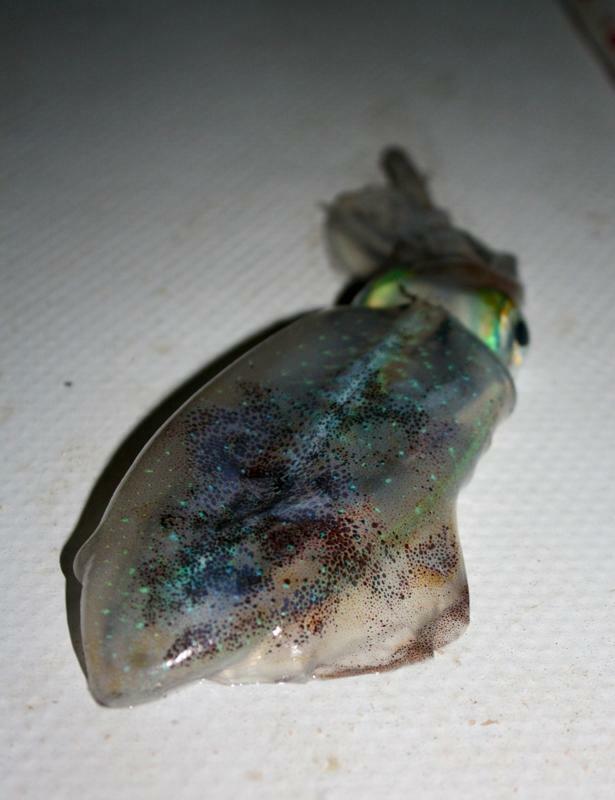 Brian jigged the lure over the side while I spotlighted the squid with a flashlight. That jig must have looked yummy because the squid made a bee-line for the lure and was instantly snagged! Brian hauled up the squid, stalling just long enough over the water for the ink to miss the deck, and dropped it into a bucket. The squid’s color changed from maroon to clear. 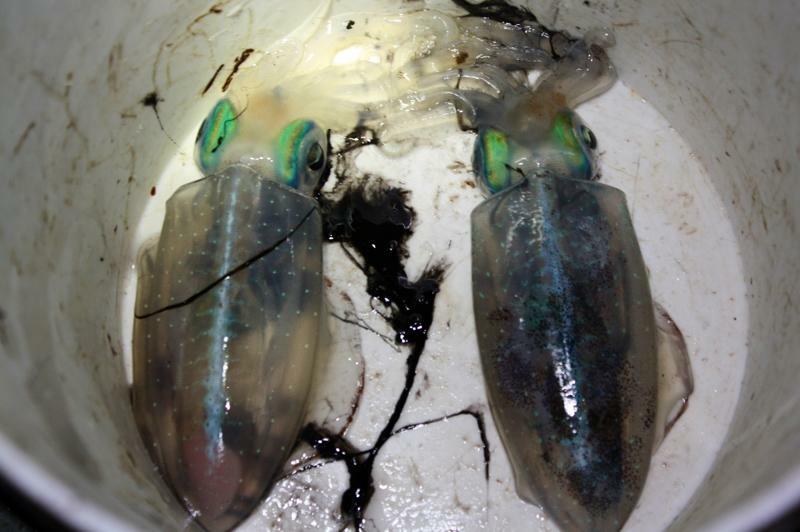 Within 45 minutes we’d added a second squid to our catch and had just enough for a nice batch of calamari. 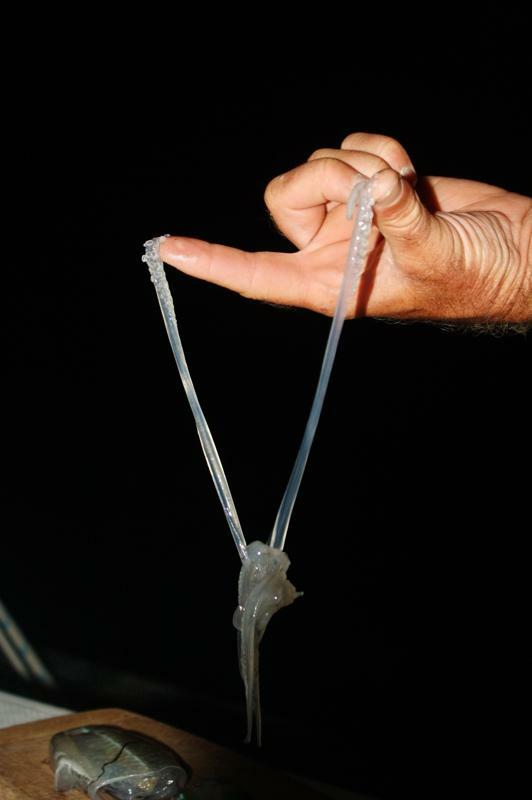 The squid were challenging to clean because the little suction cups on their tentacles stuck fast to Brian’s fingers. Brian whipped up some tempura batter and smothered the ringlets of squid in the batter before dropping each ringlet into hot oil. Scrumptious! This entry was posted in Uncategorized and tagged ragged island, southside bay, squid by stephanie. Bookmark the permalink. so sticky – that must have felt so strange! Yum!